"This cheesecake tastes even better a day or two or three after it's made. (It's never lasted longer than that at our house!)" Preheat oven to 325 degrees F (165 degrees C). Spray the bottom of one 9 inch springform pan with no fat cooking spray. Sprinkle graham cracker crumbs on the bottom of the pan. In a mixing bowl beat the cream cheese until fluffy. Gradually beat in the condensed milk until smooth. Add egg substitute and lemon juice (or lime juice) mixing well. Pour mixture into prepared pan. 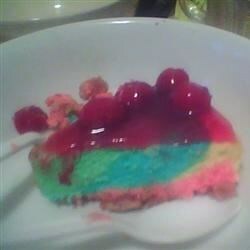 I wasnt impressed with the outcome of this cheesecake at all. It was very simple, and i followed the directions completely, but despite the reviews, I wont be making this one again. This cheesecake is a huge hit with my family! They always ask me to make it for family gatherings!